Guiding has contributed to national life in the UK and in other countries at various times over the years, but perhaps especially in the two World Wars. Here I will try to bring together some brief information on what Guides did, both in Britain, and further afield. Guiding was founded in 1910, and was still a relatively young organisation in 1914, with around 300,000 members registered when war broke out, often in scattered Patrols and Companies spread across the UK (there may well have been many other Guides not officially registered). 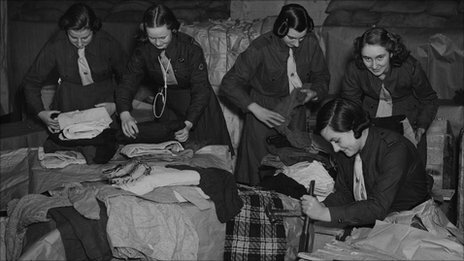 Nevertheless, the Guides achieved a lot for their numbers, and, as was the case with women in general during the war, the Guides earned new respect for girls and what they were capable of, from both the work they did, the skills which their training had given them, and the calm and competent attitude with which they worked. 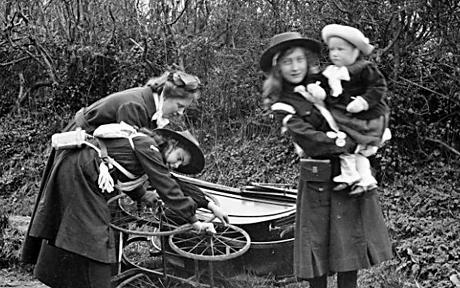 Before World War I, it was not uncommon for Guides parading in uniform to be mocked, but that gradually ceased as they showed that they weren't just some kind of militant suffragette offshoot, or pretend army cadets, or a bunch of rebel girls roaming round the streets or countryside causing trouble when they should have been at home helping mother with the household chores - but that their practical training, particularly in first aid, lifesaving, rescue work, crisis management and practical home nursing, enabled them to cope smartly and efficiently in dealing with difficult situations where well-meaning adults were often left standing around helplessly, with no idea what to do for the best. War work done by Guides included helping as telegram messengers, making dressings for hospitals and the red cross, laundering used bandages, cleaning and running rest centres, working at nurseries, teaching in infant schools, training people in stretcher work, running convalescent homes, working as hospital cooks, equipping field hospitals, running laundries, knitting and sewing garments for the red cross and soldiers' aid societies, collecting waste goods such as paper and jam jars for recycling, collecting second-hand clothes for charities, helping with harvest work and other farming and food production, working allotments and smallholdings to produce food, collecting sphagnum moss for absorbent wound dressings and herbs for medicinal use, collecting hedgerow fruits for food use, etc. Particularly in the latter years of the war, Guides were especially encouraged to take on and cultivate garden plots for food production as the scale of merchant ship sinkings in the Atlantic brought food rationing, and the very real threat of severe food shortages across the UK, extremely close. A group of around 90 Guides worked at MI5 headquarters as messengers, passing on highly classified information both in writing, and from memory (they replaced Scouts, who had been doing the job until then, apparently because the girls were more reliable!). 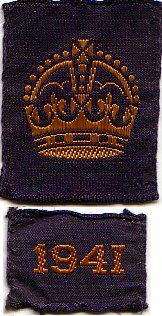 A War Service badge was created, which could be earned by 21 days of recognised voluntary war service, or 100 hours of recognised agricultural work, or the making of 15 specified garments including a pair of pyjamas, 4 pairs of socks and 2 shirts. 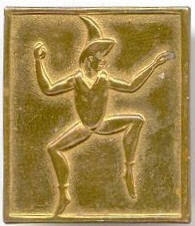 Seperate dated badges were issued for each year, as shown. In 1916 the Guides were challenged to raise £500 to build a rest hut for soldiers in France, as the Scouts had already provided one. Within a year the fund had raised £2348, enough to build a much larger hut than originally planned, with space for letter writing rooms and games rooms as well as the canteen - and enough money left over to buy a 'motor ambulance' too. Guides were also encouraged to raise money to invest in War Bonds, and a good some was raised for this cause. Money was also raised for other appeals which supported war-relief causes. Although by no means on the scale of the second world war, there were some 'air raids' during world war I, with bombs being dropped from zeppelin airships, as well as from planes, mainly in south-east England in locations such as London and Great Yarmouth, but also in other locations on the east coast of Britain, including as far north as Edinburgh. Guides were involved in rescuing people from damaged buildings, and looking after those using rest shelters. They also provided 'concert parties' to entertain people in the affected areas, often raising funds for the Red Cross or similar causes in the process as well as distracting and calming those upset by the bombing. Older Guides joined war work organisations such as the Women's Land Army, to volunteer their services - and disprove those who doubted that women would be able to cope with manual labour. In many Counties, Guiders and older Guides were specifically asked to volunteer for national war service, which would often be in factories or in farming. Guide units were often started at munitions factories, to occupy young female workforce during their breaks. Finally, at the peace conference in Versailles, France, Guides acted as messengers during the talks in 1919, being trusted to carry confidential messages throughout the talks. Guide service in World War II actually started 'before the beginning' - throughout the 1930s, but especially building up in 1938, and into 1939. Unlike the previous war, which had broken out comparatively unexpectedly, there wasn't such an element of surprise that war broke out again in September 1939, as tensions had been building steadily across Europe throughout the 1930s and various events had occurred recently which increased the risks - and although everyone comtinued to hope (and pray) that war might be averted, it had started to become increasingly unlikely that an effective peace could be negotiated, so whilst hoping for the best and encouraging positive attitudes, headquarters also urged Guiders to continue to train their Guides thoroughly with the necessary key skills they would need, in case the worst did happen. Things first came to a head in September 1938, with the invasion of Czechoslovakia, which left war seeming imminent - until the British Prime Minister brought back the famous 'piece of paper', which he had negotiated with the German government, and which appeared to guarantee peace. Thus it was, that as early as September 1938, Guides were heavily involved in assembling and issuing gas masks to the public, older Guiders and Rangers were encouraged to register with the government as volunteers for war work as part of their national service, and Sea Rangers from London and the surrounding Counties were recruited for the 'Thames Emergency Service', to serve as domestic crew and signallers on the small boats which could transfer injured people down the Thames from likely bombing target areas to the hospitals further downstream. Although the initial alarm in 1938 was averted, the tension remained constantly hovering in the background, and the country remained on the alert for war to break out at any time. The following eleven months were, in a sense, almost a let-off, a valuable chance for everyone to fit in that much-needed extra training and preparation in case of war, which increasing numbers of people, at heart, suspected must occur before long, for all that they tried to keep their hopes up. This was equally true in Guiding, where Guides were encouraged to brush up their first aid, to study and practice the air raid precaution information, to carry their gas mask as part of their uniform, to take increasing responsibility for the running of their units in case their Guiders were called away to serve, and to make plans for what war service they could offer, if they were called on to serve their country and community. In the two days immediately before the declaration of war on 3 September 1939, the planned evacuation scheme for children was activated, whereby children in urban areas gathered at their schools and were sent by specially chartered trains to 'destinations unknown' in the country - to live in rural towns and villages for the duration of the war, as it was (correctly) thought that urban areas were likely to be targets for civilian bombing. Guides were involved in meeting trains and escorting the groups of children, and young mothers with infants, to the village halls where local families would choose whom to house, and in making and serving refreshments to the weary travellers, some of whom had been en route for several hours. Others were involved in cleaning, repairing and furnishing empty houses, ready for the evacuees who were already on trains and en route. An immediate consequence of the evacuation was that many urban Guide units found themselves reduced to just the rump few over-14s who had left school and were in full-time employment - whereas rural units who had long struggled desperately to muster a couple of Patrols to keep going with - suddenly found themselves inundated with sometimes 40 or 60 Guides, all newly arrived in the area and desperate to transfer in and carry on their Guiding where they had left off. Many of the Guiders who had volunteered for war work following the plea in 'The Guider' the previous autumn found themselves called up to serve within hours or days, often being sent to bases or factories far from home, and thus having to leave their Packs and Companies behind, as also happened with those whose workplaces were transferred out of central London to safer country locations 'for the duration'. The sudden absence of most Guiders left it up to the Patrol Leaders to keep their Companies going - and often to run the local Brownie Pack too. The fact that so many units ran right through the war, despite the absence of any regular Guiders, indicates the success of the training the PLs had had. For, despite the disruption, it was important to maintain 'business as usual', in Guiding as in all other aspects of life, as far as could be managed. With the declaration of war, many Companies and Patrols volunteered their services to the authorities as teams - and were soon put to work. One Patrol helped at an evacuated nursery every morning - including bathing dozens of babies and feeding many infants and children - the Child Nurse interest badges they wore being considered sufficient qualification. A group of Rangers worked at a hospital, and from initially doing unskilled work such as washing flower vases, they soon progressed to giving injections and dispensing from the medicine trolley, as they showed their reliability and trustworthiness. Many Guide units were involved in collecting waste material - waste paper, glass, metal, jam jars, cotton reels, and sphagnum moss to make dressings, as well as fruit for preserving, rose hips for syrup making and herbs for medicinal use. Guides in many areas were involved in 'Dig For Victory', creating and maintaining vegetable plots to produce much-needed fresh food through the year to eke out rations, and helping with farm work on weekends and holidays. Some units switched to meeting on Saturday mornings, especially if they were based in urban areas and their meeting places were hard to blackout - as air raids tended to be at night, making daytime meetings safer. Later in the war, particularly in south-east England, evening meetings would sometimes be held in various Guides' houses, with the Guides then staying overnight there, so they were in easy reach of household shelters if doodlebugs became a problem, as intact halls to meet in were harder to come by. Waddow Hall, the Guider Training centre in the North of England, was turned into a children's emergency hospital for Lancashire County Council for the duration - within hours of the last Ranger Guider trainees leaving, the furniure was being cleared, beds moved, and windows blacked out - groundsheets from the camp store were found to be ideal for this! In Scotland, the Trefoil School - a residential school for disabled children - was set up by Guiders literally overnight during the first few days of the war - the children would otherwise have received no formal education as schools able to host physically disabled children were rare even in peacetime, and no arrangements had been made by the authorities for the evacuation of disabled children in war, especially those children who were housebound or could not attend mainstream schools because of their disabilities. The Trefoil School ran until 1976, by which time local authorities had taken over responsibility for the education of disabled children in their area, their building then became an adapted holiday centre for many years. As countries in europe were occupied by the invading armies, so Guides and Scouts were always among the first organisations to be banned by the new government regimes, who objected to the Guide Promise and usually preferred to set up their own youth groups, designed to teach a rather different message, albeit through a similar medium of attractive outdoor adventure techniques and games. The bans meant that Guides in occupied countries could no longer wear uniforms and meet as Guides, on threat of arrest - uniforms had to be hidden or disposed of. Some units were secretly able to keep going by becoming 'first aid cadets' or 'sports clubs', but they had to be extremely careful to avoid raising suspicions regarding their true purpose and activities. In some countries, the invading army took active steps to try and discover the identities of Scouters and Guiders, some of whom were promptly imprisoned and killed - simply for having been active in the movements, and refusing to give away the names of fellow leaders and unit members who were yet to be captured. Other Guiders and Guides became involved in resistance movements within their countries, carrying out such activities as writing and distributing 'underground newspapers', smuggling food to refugees and escaped POWs, intelligence gathering, spying and reporting information using secret radio transmitters, listening to and passing on information recorded from banned radio stations such as the BBC, and guiding escaping people through sewer networks and across borders. Although some of the Guides involved in resistance work survived, some were imprisoned or sent to concentration camps, some were tortured, and some were executed for their wartime activities. In 1940 war came close to Britain as the Channel Islands were invaded - and were held by the German army until June 1945. Guides were immediately outlawed there, as elsewhere in occupied Europe. But, thanks to the courage of a small band of Guiders and parents, unofficial meetings continued to be held on the islands, often gatherings of small groups of girls Guiders' houses, with the girls arriving at different times and by different routes, as all gatherings of people were banned. As the islands were cut off from resupply, especially after D-Day, food and fuel shortages continued to increase as the islands were held by German forces - but the allied armies lay between the German army and the French coast, preventing German supply boats from reaching the islands. Life on the islands became increassingly difficult, with the real threat of starvation as food and cooking fuel ran low, both for the locals and for the occupying army too - right up to the liberation day in 1945. Soon another type of Guide came to Britain, nicknamed 'Golondrinas' - or swallows - these were the refugees who had escaped from occupied lands in Europe, and were staying temporarily in Britain until such time as they could safely go back to their homelands. The name was coined because, like the bird who visits for the summer before returning to mainland Europe for the rest of the year, so it was hoped that the visit of these Golondrinas would indeed be temporary and that, sooner or later, they too would be able to fly home in freedom. They had a base in a special room set aside in "Our Ark", the newly-opened Guide world centre in London. They took part in 'international camps' in Britain and did a great deal to bring 'international Guiding' to life at a time when few people in Britain had ever travelled abroad, or met 'foreigners'. Most were Lones, working by themselves to tackle the same badge programme they would have at home, but where groups from a particular country were congregated in a particular location, they were able to set up 'exile units' in Britain, and do war service from their new base as a unit. Another form of wartime Guiding should be mentioned - Guiding in Concentration Camps, both in Europe and in the far east. In the far east in particular, many British children lived in colonies and protectorates whilst their parents were employed there, and when these colonies were invaded, all British adults and children were captured and taken to concentration camps, where they were then imprisoned for the duration of the war. Others, whose parents were based 'up-country' doing mission work, were living in their boarding schools when war broke out, and were captured as an entire school and imprisoned along with their teachers, often not knowing whether their parents were captured or still free. In the camps the adults tried to occupy the children's endless free time, both with schooling, and often with Guide and Scout groups, to try and take their minds off their circumstances, and off of worrying about their parents. These special units usually had members from many nations, and a programme of activities and challenges based on a merger of the different countries' programmes, adapted to circumstances - the 'half-day's hike' for first class might involve an appropriate number of laps of the camp perimeter, before the candidate could use the special stock of twigs to make a miniature model of a cooking fire, and describe just how she would cook the imaginary food on an imaginary full-size version of the model she had built. The ingenuity and bravery of the Guiders, who worked so hard to keep the children's spirits up day after day and year after year, despite the starvation conditions and the debilitating illnesses which were often rife in the camps, should not be forgotten. During the early stages of the war on the 'home front', things were strangely quiet - the period became known as the 'phoney war', as there was no bombing, and apart from the blackout and some very limited early rationing, little real disruption or change from the peacetime conditions which had prevailed before. Some of the children who had been evacuated started to return home, as their parents reckoned the evacuation to have been an over-reaction, and the risk too low to justify the separation. But, in the south east of England in particular, this was the calm before the storm, as soon the 'Battle of Britain' started. Bombing raids on London and south coast areas soon took place nightly, with raids to other areas of Britain at times too. Many Londoners more or less lived in the shelters by night, snatching sleep as best they could in the cramped and stuffy conditions before going to work by day - and a general air of tiredness pervaded, not helped by the endless worry - even if you survived the night in the shelter without suffering a direct hit, when you left the shelter in the morning would your house still be there, or be demolished and all your posessions destroyed with it? And if not your house, would relatives, neighbours or friends have died? Would your school or workplace have gone? The local landmarks, or your corner shop? Groups of Guides worked in communal shelters, running canteens, entertaining the crowds to try and take everyone's minds off what was going on, and giving first aid to any with minor injuries. Guides were involved in 'after the raid' squads, giving first aid to the walking wounded, and helping people to recover what furniture and possessions they could salvage from the bombed houses. They also started to teach 'blitz cooking', sometimes making meals for hundreds on open fires in bombed areas where no other cooking facilities existed. Mobile canteen vans were set up, staffed by Rangers and Guiders, able to travel quickly to bombed areas and serve hot drinks and food to the homeless and the emergency workers as soon as they arrived - and also to travel routes around the countryside delivering parcels of clothing, books and other comforts to soldiers stationed in lonely coastwatching or observer corps outposts, especially in winter - and often Patrols of Guides were there each night when the van returned, to wash the mountain of dishes and restock the supplies ready for the next day. Guides worked in canteens and rest centres, serving food, washing dishes and looking after young children. Guiders set up youth centres, to provide activity for teenagers who lacked occupation in the evenings, especially where parents were serving overseas or working long nightshifts in factories. Brownies and Guides were also involved in sewing and knitting garments for donation to the red cross, and to the forces serving overseas. 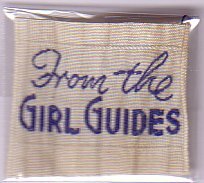 Many of these had a special "From the Girl Guides" label sewn inside to indicate that they had been made and donated by Guides. Just as the Guides in World War I had raised funds in a great national appeal, so the Guides of 1940 sought to emulate their older sisters. 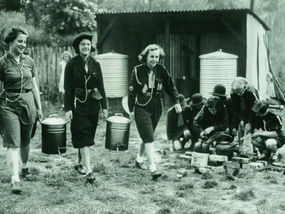 The 'Guide Gift Week' in 1940 was for air ambulance planes to evacuate injured soldiers from the battle front to hospital, with the schoolgirls being encouraged to donate a week's pocket money, and those in work half a day's salary - but, as in 1916, the appeal raised far more than the initial target - finally reaching £52,000 - and providing not only the longed-for ambulance planes, but also motor ambulances, an equipped rest hut for sailors in Iceland, and a lifeboat - while the shipyard were finishing it's construction, the appeal went out for little ships to sail to Dunkirk, so she went as she was, made several trips across the channel under fire, and on her return was named 'The Guide of Dunkirk' to commemorate her unexpected maiden voyage. 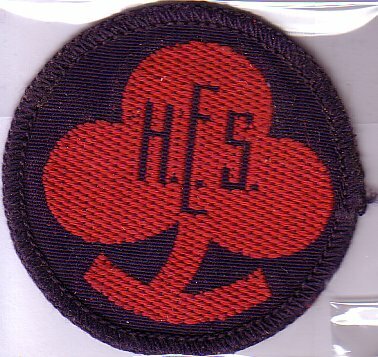 Rationing and shortages affected Guiding too - the Brownie Promise Badge was too time consuming to cut out and wasteful of materials, so alternative designs were produced, which were stamped into either rectangles or ovals of brass, rather than cut out as before. 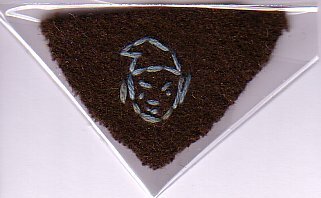 Where these could not be obtained, homemade sewn badges were sometimes seen, as Guiders used their ingenuity to make do. 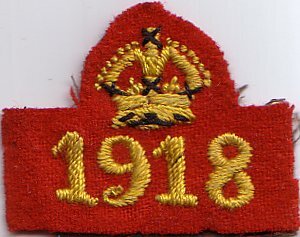 Homemade interest badges were seen too, as the regular ones ran short and fabric rationing meant factories had other priorities. 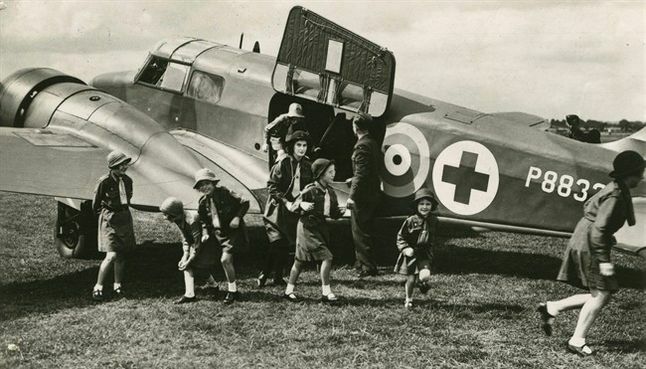 There were different uniform shortages at different times, as factories had to concentrate on producing war materials and garments for the forces as a priority, but most Guides and Brownies were able to cobble together a uniform of sorts, and it was all the more reason to look after the uniforms they already had carefully. 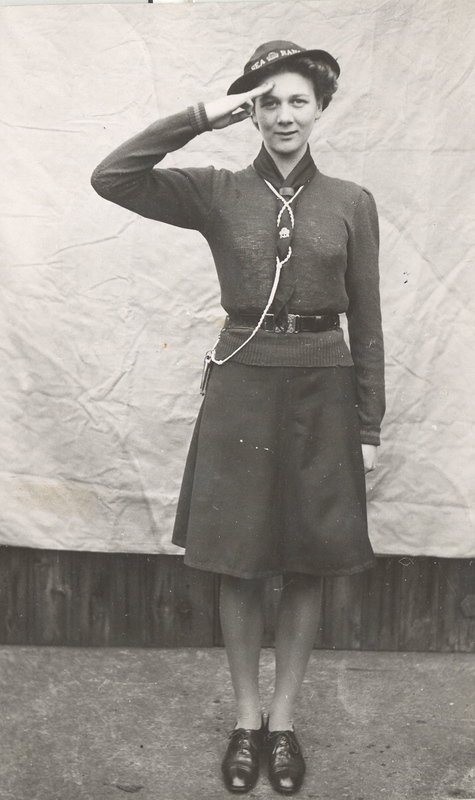 The Ranger uniform was altered, and the formal skirt suit dropped in favour of a knitted jumper and a skirt, which was easier on the coupons, especially since the jumper could be hand-knitted from waste wool rather than being bought; this was made all the more necessary by the large influx of new members to the Ranger section from those who wanted the training the section offered, so useful to those who wished to apply for roles in the women's services. Despite the disruptions, Guiding continued, and after initial restrictions during the early stages of the war, so too did camping. In July 1941 the Patrol Leader's Camp Permit was introduced, to enable Guides to hold small camps even if a Guider with camping qualifications was not available. After being banned at first, soon camping was permitted under certain conditions - tents had to be camouflaged using paint or preferrably nets, pitched under trees, and away from coasts and military installations, and numbers on each site had to be kept low to reduce the risk of being mistaken for a military camp. Sites had to be near home - but this would be automatic anyway, given the strict rationing of petrol, and the national policy discouraging unnecessary train journeys. Slit trenches had to be dug to serve as air raid shelters, and there were strict blackout rules after dusk. Camping equipment was hard to come by - some had been requisitioned by the army and some destroyed by bombing - but by raiding lofts and garages, and by a certain amount of improvisation, and creation of home-made kit, Guides could usually assemble enough kit to make do. On the home front, war work continued. For Rangers the Home Emergency Service Armlet and Badge were introduced, with a programme of training to earn it, involving initiative, first aid, air raid precaution knowledge and other skills. Following a government request, the lower age limit for Rangers was reduced from 16 to 14 so that Ranger training was available to more school leavers prior to them joining the women's services. Guides and Brownies were involved in waste collection, hedgerow fruit collection, and creating allotments to provide extra food. Garments were sewed and knitted for the forces, and toys repaired and refurbished for issue to poor children at Christmas, as new toys were almost totally unobtainable. In the February 1941 issue of The Guider, there was a commemoration of Robert Baden-Powell, who had died the previous month at his retirement home in Kenya. But there was also another message. For many months, Guides had been writing in to the magazine to ask what they could do for their sisters in Europe, as news crept out giving some vague notion of suffering there, though details were scant. Now Guides were told that it was time to start preparing an army of volunteers, ready to go into Europe as soon as war ended, to 'win the peace'. This, at a time when it was by no means certain that Britain would even win the war . . . This idea, or ideal, suggested by the Guides themselves, became the GIS, or Guide International Service. Soon applications were being received from Rangers and Young Guiders who wanted to serve on the teams, and commando-style selection weekends were held, with the applicants being challenged to cope with difficult situations and unexpected problems on no sleep and little food, hauling their kit cross-country along muddy tracks on trek carts. Those who were not old enough to apply for selection to the teams were challenged too - the teams would need funds, both to buy equipment and to provide the living expenses for the volunteers who would be leaving homes and jobs to serve on the teams for many months at a time. So the GIS fund was established. The first team set out in July 1944, to Greece. They tried to learn some of the language during the days of voyage there, and on arrival found themselves involved in providing healthcare and supplying clothing rations to villagers in remote areas, often travelling on foot over mountain passes, the clothing bundles being carried on pack mules. They were soon spotted by local Guides, who recognised the trefoil badge on the sleeve of the army tunics they wore, and the local Guides became involved in helping and supporting the work as helpers and interpreters. A hospital unit, complete with medicines and a mobile laboratory, headed into the Netherlands on the day it was liberated, and set up a hospital to diagnose and treat infectious diseases, working through the major typhoid epidemic, and setting up maternity hospitals and feeding stations for the starving. Later a group went into the Belsen concentration camp to help with food and nutrition, and deal with the repatriation of 'displaced persons' who had been released from concentration camps but needed help to find homes to go to. A further group, originating in Australia, headed to Malaya to fight tropical diseases and help locals who had suffered following the invasion there. The work of the GIS continued until 1950, long after other relief organisations had had to pull out for want of funds, and despite the ongoing shortages and rationing in Britain. Throughout these years the work of the teams was entirely supported by the ongoing fundraising efforts and donations from individual Guides, Patrols and units. As well as relief work, trainings were run in europe to help restart Guiding in the countries where it had lain dormant during the war. Although the end of the war brought peace, the feeling was generally more one of relief, rather than of celebration. Although war in Europe ended in May 1945, the war in Asia dragged on longer, and although the blackout was lifted shortly before the end of the war, rationing, especially of food, continued into the mid-1950s, and the fundraising to support the work of the GIS was ongoing, with regular appeals for more funds to help them finish their relief work. Guiding in Britain has had no direct or national involvement in subsequent wars, although Guides in the Falkland Islands were certainly affected by the occupation and war there in 1982. However, individual units have taken part in charity projects such as sending Christmas parcels to refugees, and to British soldiers serving in conflict areas, via charities.